Michelle A. Digman, Ph.D., director of the Laboratory for Fluorescence Dynamics (LFD) in the Department of Biomedical Engineering at The Henry Samueli School of Engineering, received the Young Fluorescence Investigator Award at the Biophysical Society’s 56th Annual Meeting on February 25 in San Diego. 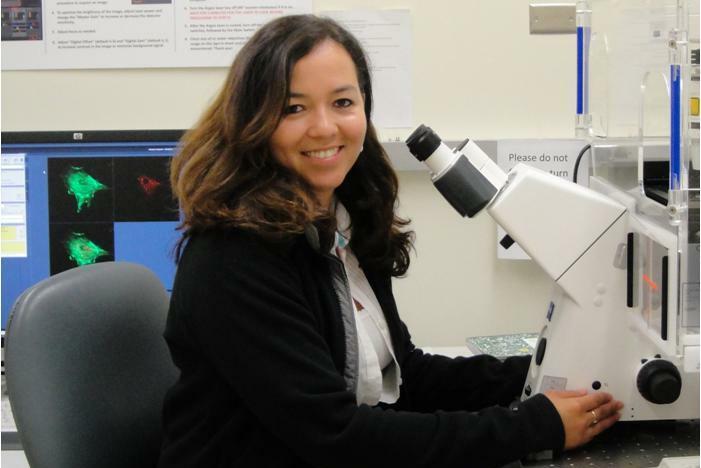 As director of the LFD, Digman mentors graduate students in their research and conducts independent research on the extracellular environment and tumor metastasis in live cells. She also performs live cell migration studies in two-dimensional and three-dimensional space. The Young Fluorescence Investigator Award is sponsored by HORIBA Jobin Yvon, Inc. and is given to an outstanding researcher at the beginning of his or her career for significant advancements and contributions in using fluorescence methodologies. Digman’s achievements in her field include the development of the Raster Image Correlation Spectroscopy (RICS) method, the Number and Molecular Brightness (N&B) analysis, the pair Correlation Fluctuation (pCF) method and the first application of the fluorescence lifetime imaging microscopy(FLIM) phasor approach to cellular systems. She began working as a postdoctoral fellow in the LFD in 2003 with Professor Enrico Gratton, Ph.D., at the University of Illinois at Urbana-Champaign and in 2006 she followed Gratton, as he and the LFD relocated to UC Irvine. In 2007, she became the scientific director of the Optical Biology Core facility in the Department of Developmental and Cell Biology in the School of Biological Sciences and in 2010, she returned to the LFD in her current position. She earned B.S., M.S. and Ph.D. degrees from the University of Illinois at Chicago in 1997, 1999 and 2003 respectively. The LFD is anationally-funded center through the National Institute of General Medical Sciences (NIGMS), and the National Institutes of Health (NIH). The LFDdesigns, tests and implements advances in the technology of hardware, software and biomedical applications. Research projects range from probing structure and function of biomolecules and membranes in-vitro using steady-state and time-resolved optical spectroscopy, over temporally and spatially correlating and tracking biological processes in cell and tissue cultures using fluorescence microscopy, to non-invasively monitoring physiological processes.